Completely Assembled. 1024 pixels per output pixel controller. Network Firmware Updater - This software update firmware on F16V2R, F4V2, F16V3, F4V3 and F48 over a network connection. The controller receives 96 universes of E131 data and can output pixel data to 16-48 strings with optional expansion boards. 2-Port Switch to "Daisy-Chain" controllers. Wireless ESP-07 Module with board mount antenna. Optional external antenna can be ordered. Falcon Player Remote Mode. The controller can store sequences on micro SD card and play in sync with FPP master. Single 4-Layer Board that is 3/8” smaller in height. 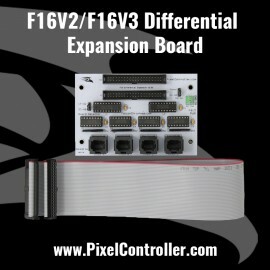 Ability to drive two expansion boards. (Up to 48 strings both local and remote). 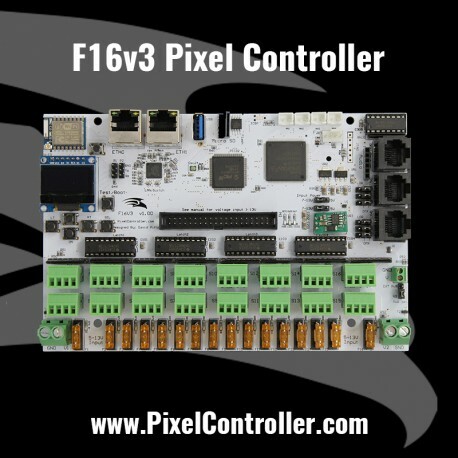 Board can be powered from pixel power or external power. Both inputs can be 5-36VDC. Power output port to power switches. Two independent sides of power. Each one can be a different voltage. 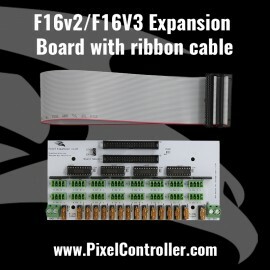 16 - Fused outputs for main board and expansion board. 16, 32 or 48 with expansion boards. 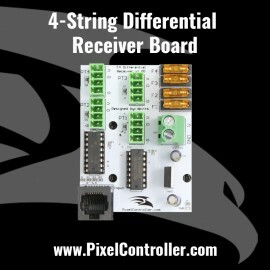 All strings can use any of the 49152 channels this controller can receive as a start address. 1024 pixels per string in 16 string mode, 1024 pixels per string shared between main and expansion boards. All string ports can be any of the following string types. They all can be independently set. 4 - Dedicated RS-485 outputs. 3 RJ-45 connectors and 1 3-pin connector (Not shown on image). .96" OLED 128x64 matrix display for setup and status. Two multi purpose LEDS for status. 1 - Processor temperature sensor. 1) Expansion board must be within 1.5 feet of main board. Maybe further but no guarantee. 2) If you live in Australia or New Zealand, DarylC will be offering the boards over there. Pricing will differ. This is the thread to see if you are in Australia or New Zealand. Please register on this forum.